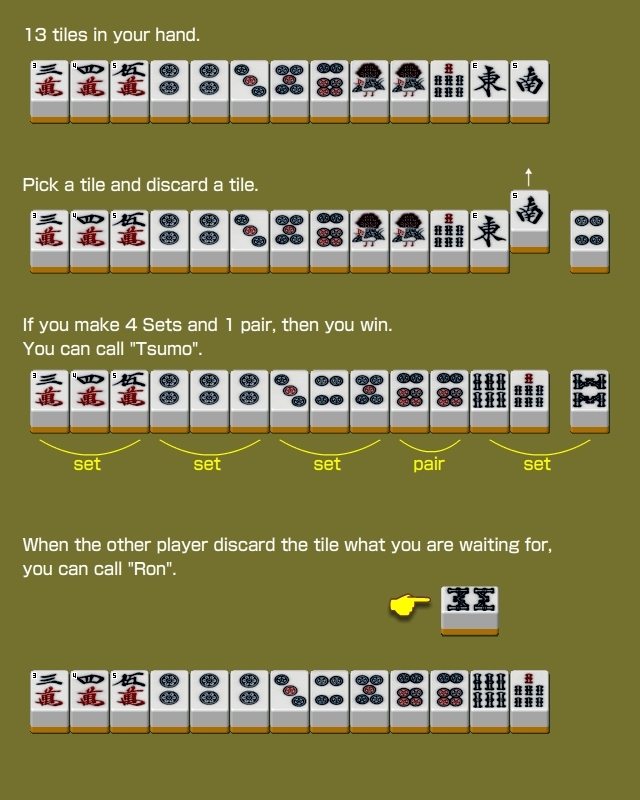 Japanese mahjong, yaku is a specific combination of tiles that increases the value of the player's hand. A player must have a minimum of one yaku in their hand in order to legally win. Each yaku has a specific han value: for each han a hand contains, the hand's point value increases exponentially. When your hand is ready and fully concealed, you can call "Riichi". Winning within one turn after declaring Riichi. Fully concealed (Menzen) and self picked hand. Winning by final Tsumo or Ron. Winning by picking after Kan.
Winning on other's added tile of Kan.
Triplet of dragon or round wind or position wind. Must be waiting two tiles. Pair must not be Yaku-Pai. Only suit tiles from 2-8. No terminals or wind or dragon. The same sequence in three suits. The same number triplets in three suits. Pon or Kan may be contained. Terminals or honors in each set. Two triplets and one pair of dragons. The following number of opened tile becomes Dora. If you go Riichi, you can open a tile under Dora. Dealer's winning of initial fourteen tiles. Non-dealer's winning of first draw. Non-dealer's winning before first draw. All kinds of terminals and honors. Three triplets and one pair of winds. All green(2,3,4,6,8 of bamboo and green dragon).